An interesting trend to hit landscape architecture in recent years is borderless fountains, where water flows flush with the pavement. If so inclined, visitors can kick off their shoes and stroll though damp pavers. Such fountains can be found by Field Operations with Diller, Scofidio + Renfro on the High Line, Digsau’s Sister Cities Park in Philly, and Field Operations’ recently completed plaza fronting New York by Gehry. 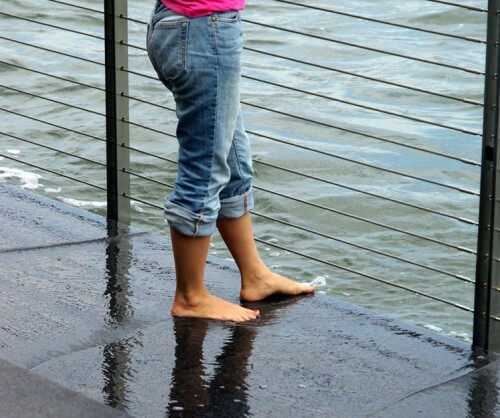 The trend seems to speak to city dwellers need to touch water. 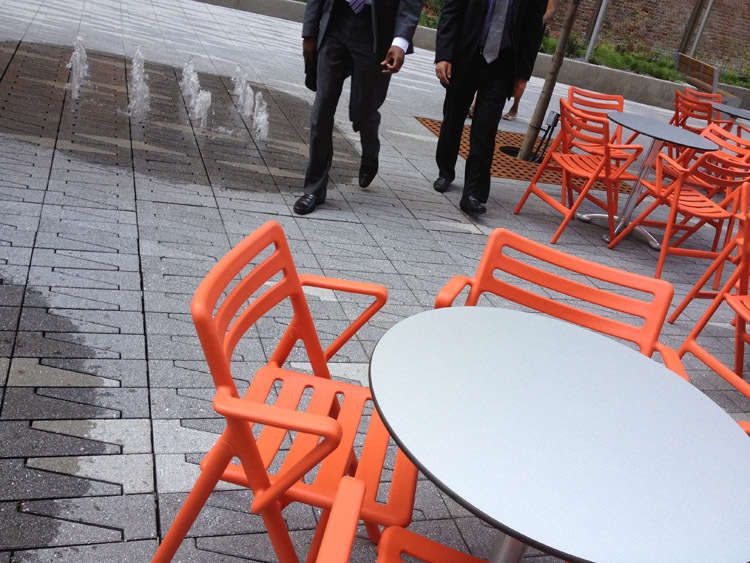 But borderless access is hardly limited to pocket parks and plazas. Several of New York’s riverfront parks are beginning to incorporate high tide into their design. SHoP’s design with Ken Smith for the East River Waterfront Esplanade use “getdowns” to the water, where the East River gently spills onto the bottom of a series of steps. 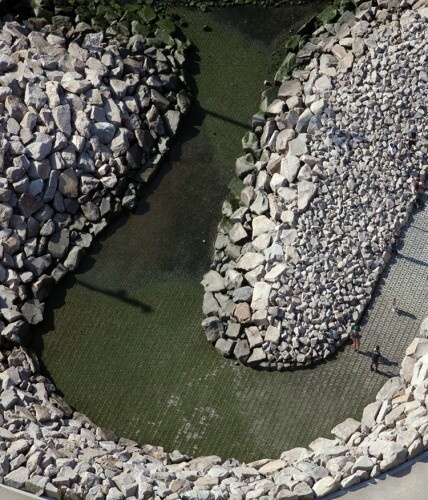 But the most “radical” design comes from Michael Van Valkenburgh for Brooklyn Bridge Park where rip rap pavers gently follow snakelike access to the actual river. Yes, you can walk down into the river! The designs speak to water access issues that will be among many topics explored this fall at the Van Alen Institute to compliment River City: Waterfront Design for Civic Life, a series of exhibitions and public programs. 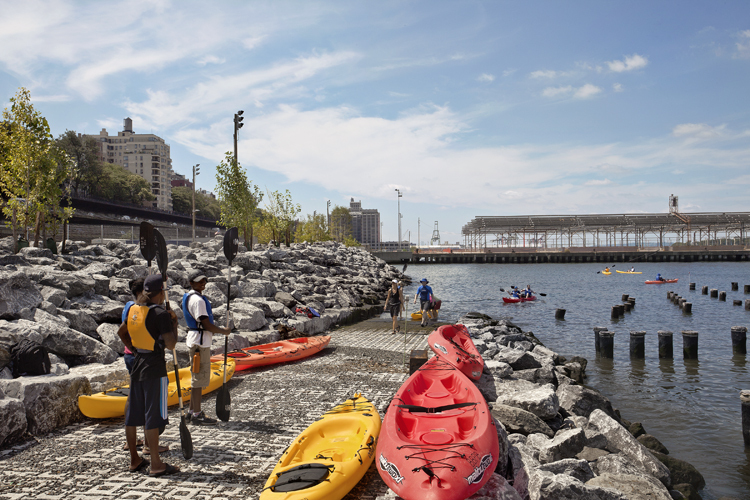 The first exhibition, Immensity and Intimacy: Brooklyn Bridge Park, explores the convergence of new development with recreation. An October 4th debate between Fred Kent (Project for Public Spaces) and Michael Van Valkenburgh will be moderated by the soon-to-be-former Parks Commissioner Adrian Benepe. The debate promises to be an all-out brawl on the public versus private control over the riverfront. The fact that folks want to touch the water shouldn’t surprise anyone in mid-August, and somehow all the aforementioned designs manage to astonish. But what’s really astonishing is that access to the water is such an oddity at all. “The whole thing is a miraculous joke, considering we’re on an island,” said Roger Meyer, chair of ConservancyNorth, a nonprofit public advocacy group in Northern Manhattan. 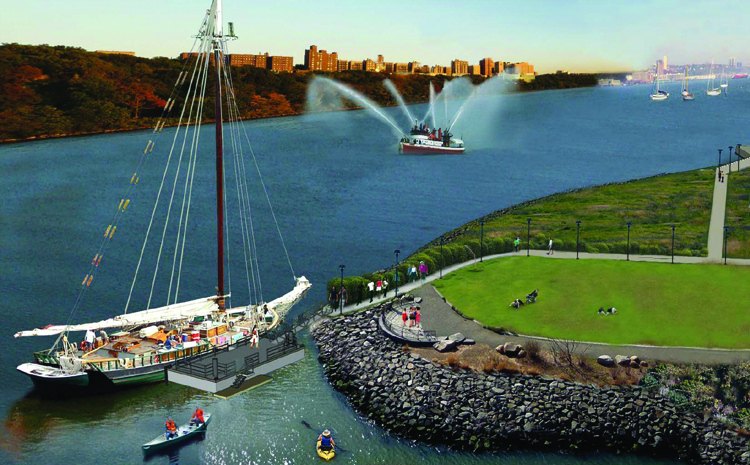 Meyer navigated the treacherous waters of Northern Manhattan’s waterfront access during debates spurred by development at Columbia University’s Baker Field. As part of the deal to build their new Steven Holl-designed athletic building, the university promised a marshland park designed by (surprise!) Field Operations with waterfront access at Manhattan’s northernmost tip. Nearby, a city-owned boathouse and dock in Inwood completed in 2006 sit unused, in part because the dock was placed in a marsh that becomes a mud flat twice a day during low tide. Whether the public will be able to use the boathouse for the new park is anyone’s guess. Meanwhile, Council Member Robert Jackson’s office confirmed that his office has allocated $350,000 toward $700,000 Eco Dock. 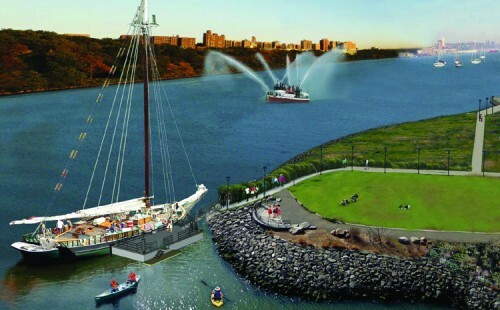 The balance will come from Borough President Scott Stringer’s office and the Metropolitan Waterfront Alliance will receive the money to build the pier. It wouldn’t be the first time that Parks has built before programming was in place. Nevertheless, access is coming and upland programming sounds like good fodder for further debate. For more on Van Alen’s “River City” programing click here. 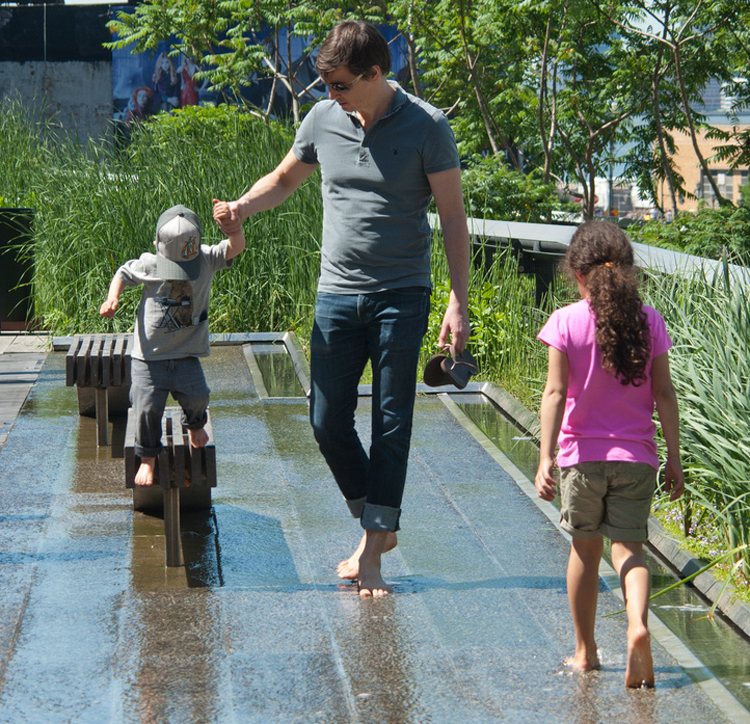 Getting feet wet on the High Line (Flickr/CasulCapture).